Sure, it might be pipped in stills quality by the Fujifilm X-T2, but for video features and quality the Lumix GH5 is untouchable at this price point. In the world of mirrorless and DSLR cameras a lot of manufacturers are brushing over 4K video capture. Canon? Doesn't want to know. Nikon? Miles behind. Not so Panasonic, whose GH5 is one of the most adept 4K capture devices available today, capable of shooting up to 4K at 60fps. Its only major competitor is the hugely impressive (and hugely expensive) Sony A99 II. You might read that above sentence and think "but what about still images?". Well, the GH5 certainly doesn't fail to fulfil its role as a stills camera star either. With the company's latest 20-megapixel sensor on board, it's got the resolution and capture smarts - including high-speed 6K Photo (that's 18MP at 30fps) - to please the most discerning of photographers. When the earlier GH4 came out in 2014 we found it mighty impressive. The GH5 builds upon this footing, but does so in a slightly larger, chunkier design to squeeze in all that extra functionality. With the camera world moving forward at a reasonably glacial pace, can the GH5's video-focused growth earn it the crown as the king of 4K and kick other manufacturers into accelerating the offerings to keep up? As long-term GH4 users - we feel it's the camera that helped to define what a top-end mirrorless should be - the GH5 successor came as an enticing prospect. It doesn't reinvent the wheel in design terms, though. The GH5 is notably larger than its GH4 predecessor when in the hand. Other than a few button repositions it's much the same as before. Take the rear, where a new control toggle has been added adjacent to the autofocus type selector; or the rotational d-pad which has been enlarged and given more definition in its rotation and click definition; or the dual SD card slot to the side of the camera; or that the video capture button no longer resides near to a rested thumb position - but on top of the camera instead. All small design pushes, but all for the better. We've found using the camera very natural, from the lock-button mode dial, to the neatly arranged white balance (WB), ISO and exposure compensation buttons atop the camera. There are also five function (Fn) buttons strewn around the camera which can be programmed as necessary for shortcuts for your most used settings. The Fn1 button is up top and makes the front and rear dials double-up as WB and ISO quick-adjust dials, rather than aperture and shutter speed dials - which can be handy. Those with eagle eyes may have spotted the slight change in the flaps to the left-hand edge where the physical connections lie, as there's now a full-sized HDMI connector, as well as USB Type-C. The shift away from using one of the compact HDMI standards has been in direct feedback from videographers, to ensure that the GH5 works with existing equipment with minimal fuss. You even get the HDMI lock in the box, so you can screw the cable down and make sure it doesn't fall out, vital if recording video on an external device. Another big change is that the GH5 has twin SD card slots. Hurrah. Very useful for video capture and ensuring there's enough capture space available on board. That the GH5 is a bigger camera could be taken as a downside, especially for a mirrorless model. However, it gives the GH5 a greater sense of purpose in one regard, plus it means there's ample spacing between buttons and dials than some smaller cameras. Still, it's smaller than an equivalent DSLR. And because of that frame the GH5 does have two top tier features in particular: a huge OLED viewfinder and large vari-angle LCD screen. Both of which are critical to this camera's makeup, as they're best-of-class is every regard. First up, there's that OLED viewfinder. It delivers a rich looking image to the eye thanks to the panel technology used; the refresh rate is high to avoid excess ghosting - an essential for videographers - and the 0.76x magnification means it delivers a huge image to the eye. With cameras like the Fujifilm X-T2 laying down the law in such regards, it's great to see Panasonic asserting that it can dish out the best too. Next up there's that LCD screen, which is also large. This 3.2-inch touch-sensitive panel betters many other cameras' 2.8-inch or 3.0-inch screens, plus it comes with a 1,620k-dot resolution to assure optimum detail in preview. The bracket mount is handy to use for waist-level and overhead work, too, and much less fussy than the system employed by Sony in the A99 II. Whereas most Panasonic G-series comes come with 45-point autofocus systems, the GH5 looks to step things up a notch with its 225-point system. This means smaller AF areas spread right across the screen for heightened accuracy. What that's particularly good for is moving subjects. Because a subject will cross multiple points when moving through the frame, the GH5 has more points of reference to make judgement calls when it comes to focus. That has inherent benefits in video capture and continuous autofocus. Whether this will make a difference to you compared to the GH4, however, depends on the autofocus type you'll be using. Single AF with the Pinpoint mode selected - which zooms into 100 per cent scale on the rear screen with a focus cross-hair to ensure pinpoint focus - feels the very same as it does in other Panasonic G-series cameras. It's still excellent and unrivalled by the competition. That said, the GH5 isn't quite perfect. With the Fujifilm X-T2 offering comprehensive and complex moving subject scenario shooting options - much like a high-end DSLR - Panasonic hasn't taken the opportunity to offer such predictive movement algorithms. Additionally, some lighting conditions can throw the GH5 - just as they did in the GH4. Take a super-bright scene with sunlight reflecting from a surface, for example, and it's not uncommon for the autofocus to freak out and acquire no focus at all. Low-light, on the other hand, rarely poses such an issue - it only will if there's a lack of discernible contrast. Overall, the GH5's autofocus is fast and proficient, with only the odd slip-up to pull it away from perfection. Some firmware tweaks over the camera's life may see this improve furthermore to be even more adept in every possible condition. As we said in this review's opening gambit, Panasonic really isn't shy of 4K capture. In its other G-series cameras it's been pushing not only the video capture, but also what it calls 4K Photo - the ability to record a 30fps MP4 snippet and extract an 8MP still from that footage. It can even shoot before the shutter is pressed to ensure you won't miss that decisive moment. That's not enough for the GH5 though. Nope, here it's all about doubling the frame-rate to 60fps for 4K Photo. And as if 4K wasn't enough then there's also 6K Photo. Which might not sound like it's that much more impressive than 4K Photo, but in the world of video-based resolutions the equivalent total pixels is a massive increase: 6K equated to 18-megapixel images, with the mode capturing at 30fps. That's hugely resolute and, assuming good conditions so the electronic shutter can cycle fast enough to negate any motion in images to be worthy of stills, it's hugely impressive. Will it catch on? Well, this is the part we're less sure about. As with 4K Photo, 6K Photo isn't hugely clear from the outset. It's tucked away on the drive mode dial on the top of the camera and, ultimately, you'll need to know what it does before you'll be able to dig deep into the Q.Menu and select from the Pre-Burst, Start/Stop and press-and-hold capture options. If you do know what it does, however, then it alone could be reason enough to buy this camera. 6K Photo is also fairly heavyweight when it comes processing and storage. You'll want to ensure you've got ample fast SD cards at the ready and be prepared to wait after making capture. It's not quick to thumb through a burst of 18MP shots - but what's great is that you can cycle through and select best-in-batch images all within the camera itself, no need to offload to a computer. The workflow potential is great. If 4K/6K Photo isn't for you then there's the more "normal" burst mode of 12fps, which captures at full 20MP resolution in the more conventional manner. That brings with it the benefit of raw and JPEG capture with better compression (it's not MP4), plus mechanical or electronic shutter options. To say that the GH5 is fully featured in the video department as consumer cameras come is an understatement. Indeed, for many, the features it offers will simply be overkill. For those who demand a given level of capture, however, the GH5 is an excellent route into videography. From 4K capture at 60fps (8-bit 4:2:0 internally) to 4K capture at 30fps (10-bit 4:2:2 - again, internally, to SD card), the GH5 has ultra-high definition covered to what is a professional grade. Other pro features include Time Code, Luminance Level, Time Stamp, Color Bars, Focus Peaking and Zebra Lines. There's no pixel binning so what you capture will be of optimum quality relative to the glass attached to the front of the camera. And we're sure that many will experiment with cinematic optic adaptors to see how far the quality can be pushed. It doesn't end there either. The GH5 is already in line for a number of firmware upgrades to add more features to its skills. One of these will be the addition of hybrid log gamma (HLG) capture, meaning that the camera will be able to capture this new standard of HDR (high dynamic range) that's being developed by, amongst others, the BBC. The whole aim of HLG is to work with legacy equipment so it's appealing to broadcasters, because it doesn't involve a huge change in workflow or equipment. And if 4K is a step beyond what you're interested in then the ability to record 1080p at 180fps is another huge bonus - the likes of which you'll find in few to no other cameras at this level. It's ideal for slow-motion capture. We've not found the camera to overheat or have issues when recording. Autofocus works well too, although it can be a touch slow to respond rapidly (which, realistically, is ideal for video capture - and those wanting more will have a rig setup to manually focus pull anyway). An electronic stabiliser mode can also be toggled on or off within the settings for all lenses, while the 5-axis stabilisation is available with select lenses (the Leica DG 12-60mm f/2.8-4 being one such example - it's also great for close-up focus). So it's with the impressive array of video capture options that the GH5 fully justifies its apparently high £1700 body-only price tag. For a feature set like this that's a snip. But for many it'll offer well beyond what's necessary and that price point then becomes rather high. Last up is one of the key areas: image quality. As Panasonic uses the smaller sensor of Micro Four Thirds, can the GH5 hold up compared to its main (and typically larger-sensor) competition? For the most part, yes. But is the quality as pristine as, say, the Fujifilm X-T2? We think larger-sensor Fuji has the slight upper hand, but isn't as on the video ball as the Panasonic. Not that the GH5 is just for videographers. With heaps of control for shooting, this camera is a great option for stills capture for a number of reasons too. Principal among them is the built-in 5-axis image stabilisation, which is reserved for stills capture only. It's really, really effective - as though you can feel it working to keep things extra steady. You'll certainly notice it in preview, let alone the multi-stop benefit it brings to final shots. 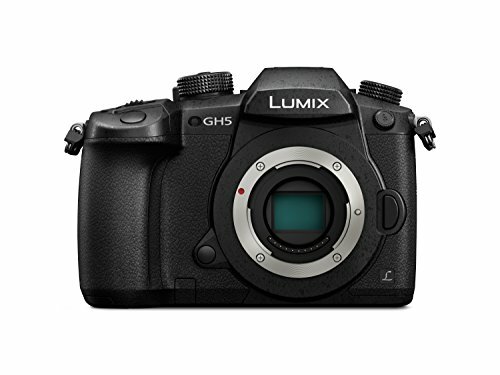 In terms of quality the GH5 is the premier camera in Panasonic's range. We've been using it with the 12-35mm f/2.8 equivalent lens throughout this review. At low ISO sensitivities (it begins at ISO 200 - shame there's nothing lower) there's ample quality and definition on show. Ramp things up and such definition does diminish a touch, with noticeable processing affecting the results slightly or specific finery within the frame not quite as standout by, say, ISO 800. Image noise isn't a big issue, however, with even four-figure ISO sensitivities holding up well, which will be a bonus for both stills and moving images. Panasonic has ample experience in balancing processing to not over-soften an image nor allow interfering image noise to disrupt an image's overall look. Overall, then, we would say that the GH5 is an adept imaging device, albeit not the best in class option when it comes to image quality's face value. The camera world has been moving at a slow pace over the last couple of years, with only small gains to be made. If you were to compare the GH5's image quality to the earlier GH4, for example, then the gains aren't that significant. But that's besides the point. When it comes to process, features and video capture the GH5 offers out-of-this-world top quality. Many will lean towards it for that video feature set alone. And we can see why: 4K capture with 10-bit 4:2:2 output (at 30fps; 60fps is 8-bit 4:2:0) and a host of pro spec features puts it head and shoulders above anything else you can buy at this price point. And when it comes to stills the inclusion of 4K/6K Photo for rapid shooting, 12fps for more conventional full-resolution shooting, and 5-axis optimisation for ultra-steady assistance all add up to something quite special. As does the improved autofocus system (despite the odd slip-up), new rear toggle control and more usable layout. Sure, it might be pipped in stills quality by the Fuji X-T2, but for video features and quality the Lumix GH5 is untouchable at this price point. With its huge full-frame sensor and advanced autofocus system, the A99 II is a mighty impressive stills and video camera. It's also of considerable expense, so that might hold people back from buying and push them toward the GH5 instead - which is a bargain by comparison. It's not a patch on the Panasonic's video shooting, but the abundance of stills shooting modes and top drawer image quality make the Fuji a top notch customer.